Men process life in boxes. If you look down at a waffle, you see a collection of boxes separated by walls. The boxes are separate from each other and make convenient holding places. That is typically how men process life. Their thinking is divided up into boxes that have room for one issue and one issue only. The first issue of life goes in the first box, the second goes in the second box, and so on. The typical man lives in one box at a time and one box only. When a man is at work, he is at work. When he is in the garage tinkering, he is in the garage tinkering. When he is watching TV, he is simply watching TV. That is why he looks as though he is in a trance and can ignore everything else going on around him. Social scientists call this compartmentalizing — that is; putting life and responsibilities into different compartments. A man will strategically organize his life in boxes and then spend most of his time in the boxes in which he can succeed. Success is such a powerful motivator for him that he will seek out boxes that work and ignore boxes that confuse him or make him feel like a failure. The drive to succeed is why men find it so easy to develop hobbies that consume their time. If a man finds something he is good at, it makes him feel good about himself and about his life. Because men tend to be good with mechani- cal and spatial activities, they get emotionally attached to building, fixing, and chasing things. Yard projects become expressions of their personalities. Their car becomes their signature. The bottom line is this: men feel best about themselves when they are solv- ing problems. Therefore, they spend most of their time doing what they are best at while they attempt to ignore the things that cause them to feel deficient. 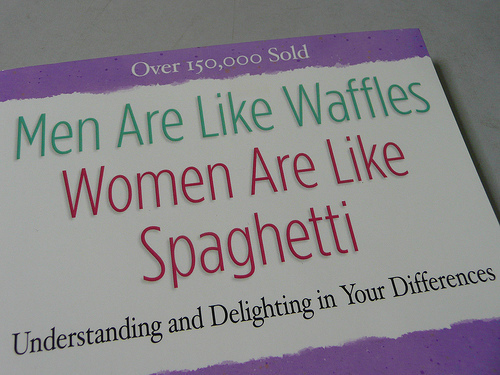 Women process life more like a plate of pasta. If you look at a plate of spaghetti, you notice there are lots of individual noodles that all touch one another. If you attempt to follow one noodle around the plate, you will intersect a lot of other noodles, and you might even switch to another noodle seamlessly. Women face life in this way. Every thought and issue is connected to every other thought and issue in some way. Life is much more of a process for women than it is for men. This is why a woman is typically better at multitasking than a man. She can talk on the phone, prepare a meal, make a shopping list, work on the agenda for tomorrow’s business meeting, give instructions to her children as they are going out to play, and close the door with her foot without skipping a beat. As a result, most women are in pursuit of connecting life together. They solve problems from a much different perspective than men. Women consistently sense the need to talk things through. In conversation they can link together the logical, emotional, relational, and spiritual aspects of the issue. The links come naturally, so the conversation is effortless. If they are able to connect all the issues, the answer to the question at hand bubbles to the surface and is readily accepted. This often creates significant stress for couples. While she is making all the connections, he is frantically jumping boxes trying to keep up with the conversa- tion. The man’s eyes are rolling back in his head while a tidal wave of information is swallowing him up. When she is done, she feels better and he is overwhelmed. “Honey, the other day I was driving by your favorite truck store—the one where you got that cool cup holder that goes on the window; and that truck store is right next to my favorite dress shop. You know, the one with the cute two-piece suit in the window? That suit is my color. You know, last week I went to that seminar on colors to find out what colors look good on me and what colors don’t, and they said I was a ‘summer’ and that suit is a summer color so I knew if I bought it and put it on you’d say, ‘Oh baby, you look so fine!’ and I love it when you say that. I was thinking that suit looks a lot like the one Mrs. Clinton wore when she was saying she communicated with Eleanor Roosevelt for inspiration. I don’t know, that seems kind of weird because Eleanor is dead. Isn’t that kind of like some of that New Age stuff we heard about in church on Sunday? That kind of stuff is creeping into the schools. Maybe we should stop and pray for the kids!” The whole time his wife is praying, he’s thinking, “So what about my truck?” One thing that creates havoc in male/female interaction is the fact that most men have boxes in their waffle that have no words. These boxes contain thoughts about the past, their work, and pleasant experiences, but these thoughts do not turn into words. Not all of the wordless boxes have thoughts, however. 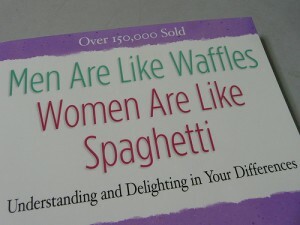 There are actually boxes in the average man’s waffle that contain no words and no thoughts. These boxes are just as blank as a white sheet of paper. They are EMPTY! To help relieve stress in his life, a man will park in these boxes to relax. Amazingly, his wife always seems to notice when he is in park. She observes his blank look and the relaxed posture he has taken on the couch. She assumes this is a good time to talk as he is so relaxed, and so she invariably asks, “What are you thinking, sweetheart?” He immediately panics because he knows if he tells the truth she will think he is lying. She cannot imagine a moment without words in her mind. If he says, “nothing,” she thinks he is hiding something and is afraid to talk about it. She becomes instantly curious and mildly suspicious. Not wanting to disappoint his wife, his eyes start darting back and forth hoping to find a box in close proximity that has words in it. If he finds a box of words quickly, he will engage his wife in conversation and both will feel good about the relationship. If he is slow in finding words, her suspicion fails to be extinguished and he feels a sense of failure. He desperately wants to explain to his wife that he sometimes just goes blank. Noth- ing is wrong, he isn’t in denial, and nothing is being hidden. This is the way he has been his whole life, but she cannot imagine it. These blank boxes have an interesting characteristic that often gets in the way of meaningful conversation. In the middle of conversation a man will periodi- cally be moving from one box to another, and in between two boxes of words he passes through one of these blank boxes. Right in the middle of conversation, he goes silent. He knows he should have something to say, but he is blank.